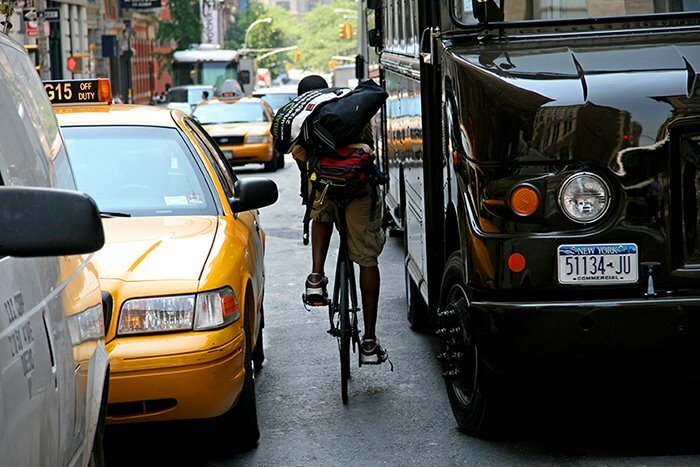 The NYC bike messenger is the epitomizes New York on edge. These people put their life on the line for little money and no benefits. Of course, a comparison to the Police or Fire Department is unfair - bike messengers are not public servants hired to protect citizens. And it is a for profit business. But they risk their lives for no glory. An extraordinarily dangerous job with no recognition. The job itself demands the ultimate in utility - a whole style of bike outfitting and accoutrement has been spawned by the riders, some of it spilling over to those interested in sporting a street style. Perhaps the most notable item adopted by non bikers, is the messenger bag - the Manhattan Portage. Many experienced messengers (like the one in the photo) will use a fixed gear bike (aka track bike). There is a minimum of parts and maintenance. They offer control, light weight and quick acceleration. There has been an up trend in use and interest in these bikes. Also de rigeur is the heavy duty 3 foot bike chain and locks - this is a whole discussion unto itself. Theft is a huge problem here and virtually every type of innovative lock has been used. In the end, the simple heavy duty chain and American style lock have proven most reliable. Thieves have used huge bolt cutters and all manner of tools and techniques to break locks and chains. And it is not unknown for a thief to take the bike and the thing it is locked to if feasible. Or take parts and leave the frame - see Left for Dead here. You can read about these and other matters at the NYMBA (New York Bike Messengers Association) website. Here are two quotes from their website about the job as told by messengers Hermes and Tone. the worst weather imaginable, and deliver heavy, bulky items for an extra $1. stressed to the breaking point." moving trees, called pedestrians, in this konkrete jungle we call New York. I guess it’s hard. It’s definitely not for the weak hearted."